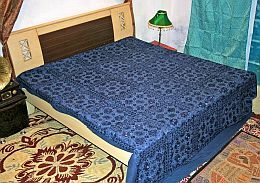 Handmade Indian bedspreads-Wholesale Indian BedSpreads. Our online catalogs provide complete bulk buying convenience to retailers, store owners, resellers, eBay sellers, small wholesalers, exhibitions, festival fair vendors, boutiques and designers who wish to buy directly from a manufacturer exclusive and amazing stuff at discount prices. 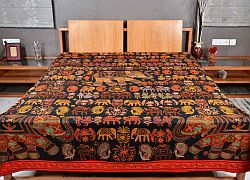 To create that exclusive collection for your store, panpaliya provides mirror work bedspreads, Applique work bedspreads, Patch work bedspreads, embroidered bedspreads, silk bedspreads and much more Checkout website. More Details:- Hand Mirror work is hand embroidery done with small pieces real mirrors. This is the specialty of our city and some of our customers have been regularly repeating this designs for 4 years now. We will offer branding of your store, special packing and any custom changes in size or style. 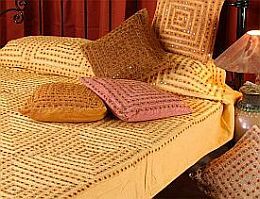 More Details:- Bohemian exotic Embroidered bedspread. The amazing and sheer amount of embroidery makes this design one of best home decorative offered by us. Do ask for more details to create a unique and exclusive collection for your store. 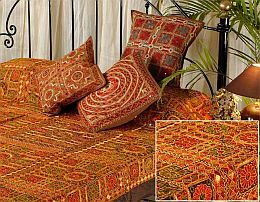 More Details:-Bohemian exotic hand printing by viscos thread all over the bedspread. The amazing and sheer amount of embroidery makes this design one of best home decorative offered by us. Do ask for more details to create a unique and exclusive collection for your store.